I’ll start off with the earrings first. It’s interesting to know that earrings were once favored as daily accessories and worn not only by the women, but also the men. Dated back to the Three Kingdoms, they were popular and usually made of precious metals such as gold, silver, and bronze. Gold earrings were usually worn by the royalties, depicting their status as the rulers and those who held power in the country. There were three types of earrings or eehwan (이환) in Silla Dynasty, where they were the most sought items: simple, dangling, and showy. Simple earrings consisted of single loop; dangling ones had a loop attached to the clasp; showy earrings were made as multiple loops with lavish decorations attached to a loop. Empress Sado of Silla with a showy gold earrings. Notice that a curved jade bead was attached to each of the earring’s ends, like those put on the famous Silla’s gold crown. 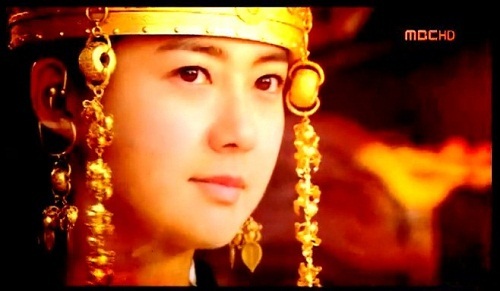 Queen Seondeok wearing the infamous Silla’s earrings decorated with small gold leaves. The men wore earrings as a symbol of youth and ability. Although both male and female could wear earrings, Men usually opted for thin earrings or sehwan, while women would choose taehwan, or thick earrings. The difference lied in the thickness of the upper ring or loop of the earrings. 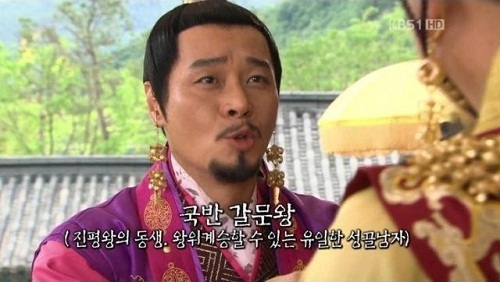 Even the young Lee Seong-gye wore earrings! 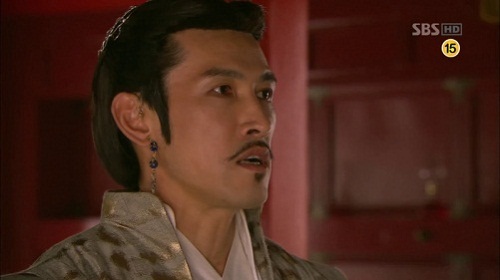 The practice was continued during Goryeo Dynasty but not many earrings were found from the dynasty. 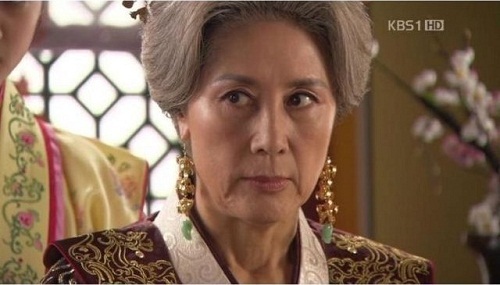 However, earrings became unpopular during Joseon Dynasty because of the influence of Confucianism. According to the teaching, taking care of one’s body is a way of showing filial piety as the body is from the parents. Piercings were considered an undutiful act since it would hurt the body,thus limiting the usage of earrings in daily life. In addition, there was a restriction called by the government to limit the usage of personal ornaments, especially those made of gold and silver. It was said that the policy was caused by the economic crisis due to importing gold and silver from Ming Dynasty of China. Earrings for men eventually disappeared and women only wore them when the occasion called for it, for instance wedding ceremony. Simple earrings were preferred over those dangling ones. Rings were popular ornaments during Joseon Dynasty. They were commonly referred to as jihwan (지환) and they were two types of rings in Joseon Dynasty: garakji (가락지) and panji (반지). Panji was a single ring worn by single ladies. It indicated that the wearer was still single. Garakji literally means “a pair of big rings” and they consisted of a pair of rings made from various metals and stones, according to the rank of the wearer. Garakji were reserved only for the married women. They held special meaning in marriage life, as they symbolized the harmony between husband and wife according to Confucianism. When the husband died, one of the ring would be given to the husband while the wife kept another one with her until she die, symbolizing faithfulness. Garakji and binyeo were also used as wedding gifts to the bride. Giving garakji or binyeo to a single woman had the meaning of asking her hand in marriage and the man liked her. 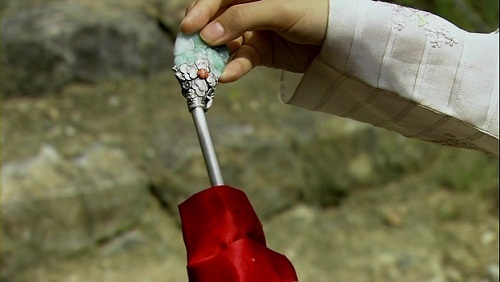 So that’s why Princess Kyung-hye was so mad when Seung-yoo gave her those rings, thinking that she’s Se-ryung. Thanks – I love your posts about traditional Korean culture. I have learned so *so* much from reading your posts. I especially love that use English translations of Korean words so I can understand and pronounce it (i.e. “panji” for a single ring). You’re welcome! Glad to share what I’ve found out on the internet 🙂 Thanks a lot for your encouragement! Awesome post! I’m always curious about the beautiful jewelry characters wear in period dramas!! Another interesting and informative post! Thank you for your work. The accompanying photos are great examples of the descriptions. This was really informative. I haven’t watched any period dramas other than Joseon so I haven’t seen the amount of jewelry they wore then. But these look really pretty and it’s interesting to know that almost every piece of jewelry has some kind of a meaning. I especially like the idea of Garakji rings and how one of them is given to the husband after his death. It seems like a lovely gesture of faitfulness and affection. I’ve been wondering about the lack if jewelry. 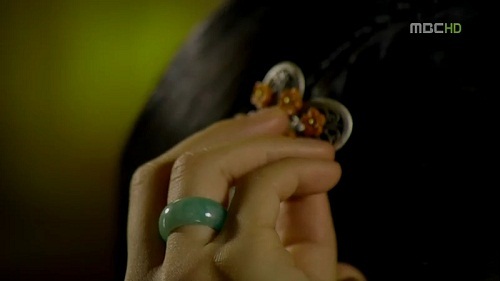 So, Jang ok jang & Cruel Palace, I’ve noticed bigger rings than the ones mentioned. Decorated ones too. Where do they fit into this explanation? What about wearing braclets and necklaces since those don’t involve piercings? Finally, when did Korea switch back to earrings? In modern dramas, women usually wear earrings (really pretty ones!) but wouldn’t confucianism still be a strong influence after hundreds of years of Joseon? Besides the piercings issue, there was also the issue about the gold and other precious metals, hence that was probably why the women were restricted from wearing too many ornaments. Necklaces and bracelets didn’t have significant functions like the rings and the hairpins, so their usage probably disappeared just like that. Korea was famous for its Hermit Kingdom concept but when Japan occupied the country, it can be said that the occupation opened Korea to other countries’ influence, including Western clothes and the other ornaments. Same goes for the religion, where Christianity made its way into the country way before the occupation, during Joseon Dynasty. I’ve been catching up on Cruel Palace lately, and er, did they really wear such big hair pins? if so, how on earth did they keep them in place? And thank you for answering all my questions! No worries, and thank you for replying! Someone like me who’s hair is thin would never manage a palace hairdo. And I’m still amazed their hair doesn’t move out of the pins, no matter how much they scream or cry. I want to see someone’s hair being done up like this. That’s why the wig was such a prized possession back then 😉 It did help those with thin hair and in the dramas, the actresses usually use wigs as the substitute for the big bun since they don’t keep long hair. I believe the people back then relied on their original long hair to make the bun and only in some circumstances they used wigs. LOL I think the hairpins would only come out once they start pulling each other’s hairs in the drama, which something impossible to happen in dramas considering how women would act with dignity and grace back then. I found this tutorial, and of course, a lady would’ve had a maid to help her with an elaborate do, but this is a simple way for someone with long hair to use a long pin: http://www.youtube.com/watch?v=iG9PPb8gCsI. i want to ask, if binyeo is like a wedding gift or used for propose by a man. Is dwikkoji have the same symbol too with binyeo? maybe not for a wedding gift but a proposal? i watched six flaying dragons, scarlet heart and flower in prison. The 3 men in that drama gives dwikkoji not binyeo. i am confused hehe..